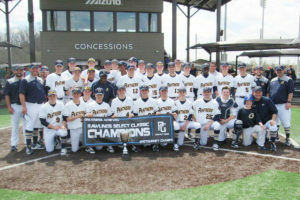 The O’Fallon Panthers baseball team is off to a hot start with a 7-1 record. Coming off their third straight 30-win season, finishing 33-6, the Panthers already seem to be on their way with an impressive early season display so far. Their first victory was their first game of the season as they defeated Chatham Glenwood 1-0. Logan Boente and Hayden Juenger allowed a total of three hits and outdueled Louisville commit Reid Detmers. 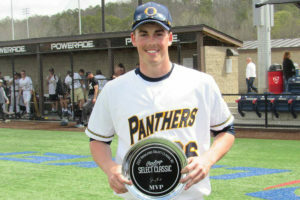 Jacob Dreyer drove in Christian Koechner in the top of the seventh inning for the game-winning run. O’Fallon then defeated Moline 9-0 and lost to Joliet Catholic 11-1 to conclude their first week of the season. After an 8-3 victory over Columbia, the Panthers traveled down to Emerson, GA to take part in the Perfect Games Rawlings Select Classic. O’Fallon defeated Ensworth High School 5-2, Dematha High School 8-5, Savannah Christian 1-0 and claimed the championship over a hard fought game against Cullman High School from Alabama. With just 11 plate appearances, Jacob Dreyer has the highest batting average at 400, while Jordan Richardson’s is at 381. With 23 plate appearances. His eight hits currently lead the team. Quinn Lowery, Chase Hackstadt, and Josh Gibson are all batting over 300. So far the lineup has produced a total of 38 runs. The main reason why the Panthers have won seven games against tough competition is their strong pitching. Heath Zuber is 2-0 and has accumulated 12.7 innings pitched with a 1.66 ERA. Boente has the most wins and stands at a perfect 3-0 with 11.7 innings pitched and had yet to give up a run with a 0.00 ERA. During his three starts, he’s given up just four hits as well. Another pitcher off to a solid start to the season is Brayden Arnold. His record is perfect at 2-0 with two starts, and 10.3 innings pitched. The Panthers have another busy week with a couple of Southwestern games away at Alton on Tuesday and Thursday against Collinsville at Fletcher Field (both games start at 4:30 pm). On Saturday the Panthers will partake in a doubleheader at Blaizer Field starting at 10:00 am, against Harlem. Chaminade is the last opponent, which is set for 3:00 p.m.